I know we sure appreciate your bringing reports here, Bev! Thank you very much! When I hear of juvies being harassed by crows, I think of Spark when he fledged & was being harassed by a crow, but Boomer took care of the crow! I guess I'm wondering like the rest of you if that eye is going to interfere with Hunter's flying. Well, if there is a problem this is the time for it to surface when there are many people watching & ready to help. Seeing nobody on the ledge, I checked the San Jose forum. Evidently Hunter fledged early this morning and is in a spot where she will need to be rescued when they can get access (if I read it correctly). Anyway, that's a good thing as they can give her eye a good examination. glad yo u got the news here about Hunter. Security has been notified so this is good. hoping her eye is O.K. I f I hear anything before you do ljames, I will let you know. I am ou t most of day. Just read that Hunter is on her way to the dr. to have her eye examined, although the person that rescued her (I think) said that it looked good. Sky is on the roof and Clara brought her something to eat. Buzo is on a perch somewhere and they are hoping she will get to a higher spot. Poor girl . not getting much protection, but adults are busy. Thanks for the updates! As I said yesterday, I was hoping that Hunter would need rescuing (but not be hurt) so her eye can be checked & so far it sounds very encouraging! Thanks bev. It's a miracle it's ok as long as she drug that thing around in her eye and everybody plucking at it, plus she had to jam a few times. I'm so relieved that her eye will be fine and a dose of antibiotics is what I was hoping for. I'm very relieved, too! Thanks, Bev! Am unable to get the cam this morning. Well probably won't see them that much more on the cam anyway. 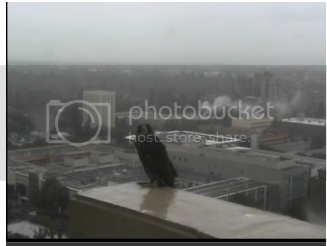 Pretty sure this was Hunter on the nest ledge today, hung out in the rain forever. I'm glad she's getting the rest and I'm sure she will be off again tomorrow. Thanks for the link to the pictures on Flicker, ljames! Some goodies in there, including the initial examination of Hunter's eye. Looks good & it appears the damage was minimal & not permanent. It would be nice to have a better cam here next season. It was hard to tell what you're looking at because this one is so blurry. But I guess we've just gotten spoiled with all the great cams out there with many including sound. Boots on ground doing a great job. I guess they have all in air at same time , at times. Keeping them busy but they say skye is doing really well. 'hunter is working on landings. But they are all doing well. 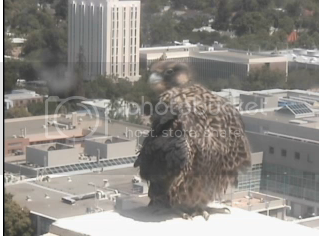 Glad a male is not in mix, as they tend to tag girls when they fledge. simply because they want to play and girls are just learning. Somebody is at home preening!